Many new components have HDMI® ports, but sometimes you may still have a DVI monitor or cable box. In this case a HDMI® to DVI-D cable would be used. This cable connects HDMI® devices to DVI-D devices and supports resolutions up to 1080p. This would be necessary if a cable box or PC has a DVI out, but the monitor or other device only has HDMI® in. Essentially, the video portion would be the same quality as an HDMI® to HDMI® cable, but the main difference is that DVI only supports video. 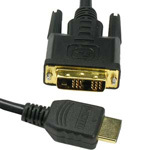 If you are using an HDMI® to DVI cable you will still need a separate cable to transmit audio such as an RCA cable. HDMI® is backwards compatible with DVI, and the HDMI® detects the DVI on the other end and switches to the DVI protocol. These cables support the HDMI® Spec 1.4, and are RoHS compliant.